(InvestmentNews.com)-Financial advisers rejected a recommendation Friday from the acting chairman of the SEC that will loosen the accredited investor definition (aka QIB) and increase investor access to private and exotic investment strategies that are usually reserved for rich people. “I think this is an awful idea, as awful as ideas come,” said Scot Stark, owner of Stark Strategic Capital Management. Reacting to comments made on Friday by acting Securities and Exchange Commissioner Michael Piwowar, which recommended allowing more retail-class investors access to investments currently restricted to people with a net worth of at least $1 million, a lot of advisers didn’t see the logic. “Any guidelines that help to protect the investor consumer is a positive,” said Mark Germain, chief executive of Beacon Wealth Management. During his speech Friday, Mr. Piwowar referenced the “forgotten investor” and said the current accreditation rules limit access to types of investments that could increase portfolio performance and diversification. “I question the notion that non-accredited investors are truly protected by regulations that prevent them from investing in high-risk, high-return securities available only to the Davos jet-set,” he said. But most financial advisers are questioning the logic of increasing access to products and strategies that typically come with higher fees, less liquidity, and less regulatory oversight. The Securities and Exchange Commission is considering changes to its 30-year-old definition of “accredited investor” that could have serious implications for the crowdfunding industry. Accredited investors are permitted to participate in private securities placements, and since the passage of the JOBS Act in 2012 opened the door to general solicitation for investors, many have been finding those opportunities through crowdfunding platforms. 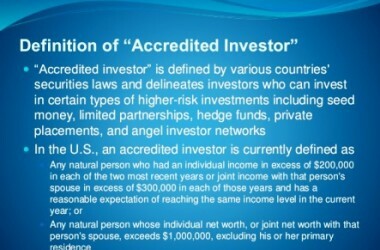 The current definition of an accredited investor, written in 1982, says it is a person with earned income in excess of $200,000 (or $300,000 with a spouse) in each of the prior two years or one with a net worth over $1 million (alone or with a spouse), excluding the value of his/her primary residence. Those pushing for change say the income thresholds have not been updated for inflation—that in today’s dollars, $200,000 and $300,000 would be $500,000 and $700,000. But critics, like Brendan Ross, president of Direct Lending Investments, say such a change would halve the number of accredited households in the U.S., which today make up, by the SEC’s own calculations, 7.4% of all households.